After you give the initial dose of calcium, give 100 mg every 4 hours (50 mg for smaller squirrels such as red squirrels, flyers, or juveniles less than 12 weeks old). The first day, getting calcium dosed quickly is more important than the type of calcium or amount. Going forward, most squirrels will need around 500 mg per day (250 mg for flyers or small squirrels). See the Long-Term Treatment for MBD, below. *Any kind of calcium pill is okay for the first dose, and you can use Tums for a few days, but long-term it’s best to use plain calcium carbonate (without Vit D). The easiest way to dose calcium longer term is to mix it with a small amount of peanut butter, crushed nuts, yogurt, baby food, or any food the squirrel likes. This way you don't have to continue to force-feed the calcium, which stresses the squirrel. The acute symptoms (weakness, loss of appetite, lethargy, seizures, paralysis) will usually improve within a few hours or days, but this does not mean the squirrel is cured. It will take months to rebuild the calcium in the bones. Heat is soothing for a squirrel with MBD. Use a heating pad set on low heat (make sure he can't chew the pad or cord) or a rice buddy (a sock filled with dry rice/beans, microwaved for about 20 seconds). Starting on the second day, most squirrels will begin with 500 mg elemental calcium per day (250 mg for flyers, etc.) divided into 5 doses. 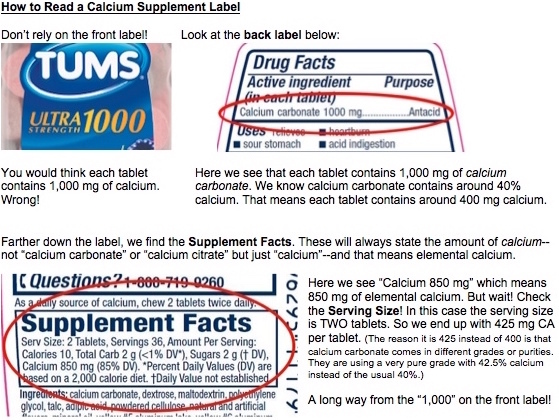 See How to Read a Calcium Label below for more info. Note: the label on Henry's Healthy Calcium uses elemental calcium. 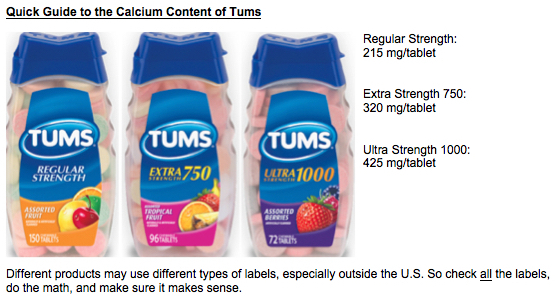 Keep notes on how much calcium you give so you can adjust the dosage if needed. It is best to work with someone knowledgeable about MBD when adjusting the dosage. Within 1-5 days your squirrel should be alert, active, and eating, with no seizures or paralysis. If your squirrel is still having symptoms or is having "ups and downs" during the day, you may need to increase the dosage. Or you can try giving smaller doses more often. Note: Once your squirrel begins eating Henry's blocks, you should cut his calcium dosage in half because the blocks also contain calcium. Remove ALL seeds, nuts, corn, and treats, including stashes. Follow the Healthy Diet for Pet Squirrels. Your squirrel MUST eat blocks every day (either 2 Henry's Healthy Blocks per day, or a small handful of rodent block per day). Once you have figured out the best dosage schedule for your squirrel, he is eating Henry’s blocks every day, and he remains stable for 2 weeks, you can reduce the total daily amount of calcium by 50 mg. Continue reducing the dosage every 2 weeks until the squirrel is only getting 50 mg of extra calcium per day. Then after 2 months, try eliminating the extra calcium altogether.